All doses given for 40 L (10 US gallons). Tanganyika: Use 11 g (1.5 teaspoons). Malawi: Use 5.5 g (3/4 teaspoon). Victoria: Use 3.6 g (1/2 teaspoon). Dosages are based on DI or RO water; for other water, measure hardness (GH) first, then add according to need. For reference, the Tanganyika dose raises dGH by 8.8 units. The Malawi dose raises dGH by 4.4 units. The Victoria dose raises dGH by 3 units. TIPS: Use when setting up an aquarium and when making water changes. To add salt to an established tank, base dose on water being changed. Do not use salt when simply replacing evaporated water. It is best to dissolve the salt in freshwater before use. I'm using Cichlid Lake Salt™ with Malawi/Victoria Buffer™, but found my pH to be higher than desired at 8.6. What have I done wrong? A: The directions are designed for use with DI or RO water. If you are using untreated water as your source water, this will, depending on how hard the water is, influence the final parameters. When both Cichlid Lake Salt™and Malawi/Victoria Buffer™ are used as directed in relatively pure water, the water parameters will approach very closely the parameters of the native lakes. If other sources of minerals are present, such as untreated source water or a dissolving substrate (e.g. aragonite), then the conditions of the lakes will not be duplicated as closely. While a pH of 8.6 is a bit higher than targeted by these products, I expect the pH will likely settle down to something closer to 8.2 – 8.3, even if other sources of minerals are present. Is there anything I can purchase to help me monitor the salt content in my Cichlid aquarium? Will a hydrometer work in this case? A: Conventional hydrometers are skewed to measure salinity in sea water. Sea water is denser than the African Rift Lakes. In this case, a a hydrometer will not give an accurate measurement. Instead of using a hydrometer to measure total dissolved salts, I would be more concerned with GH (general hardness which is more specifically measured as calcium and magnesium), especially if using our Cichlid Lake Salt. GH test kits are inexpensive and can be found at most aquarium stores. I'm using Cichlid Lake Salt™and my GH is slowly going down. How can I combat this fluctuation? A: Once this product is used to establish a GH value, under normal conditions, GH should not change significantly before your next water change. If your GH is dropping, there are a couple of possible explanations for this occurrence. 1) These minerals are actually getting consumed by the vertebrate and invertebrate life in your aquarium (fish, plants, etc.) at a phenomenal rate, or 2) These minerals are being precipitated out of solution. This is possible if there is excessive phosphate or excessive carbonate hardness (KH) in the aquarium. This could be caused by use of phosphate based products, phosphate that may exist in the well water, or if your well water has an existing KH value. 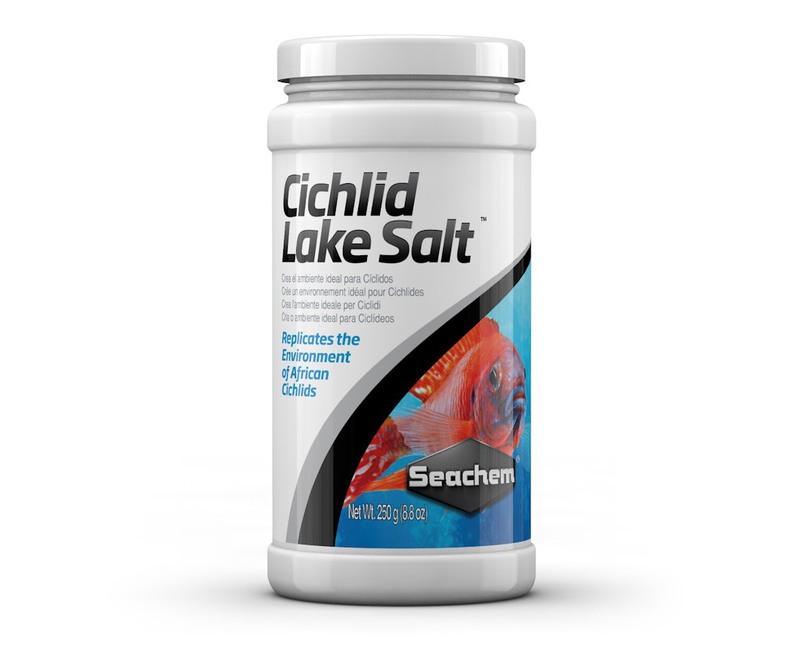 To replenish these minerals, you can use Cichlid Lake Salt™as needed to build GH. I would also discontinue use of any phosphate based products and use a phosphate remover like our PhosNet to reduce any phosphate that may be in your source water. If high KH is the culprit, you can perform partial water exchanges to dilute your existing KH value. I use Cichlid Trace™, but I saw on your website that water prepared with Cichlid Lake Salt™is nearly identical in mineral composition to Lake Tanganyika water, so why both? 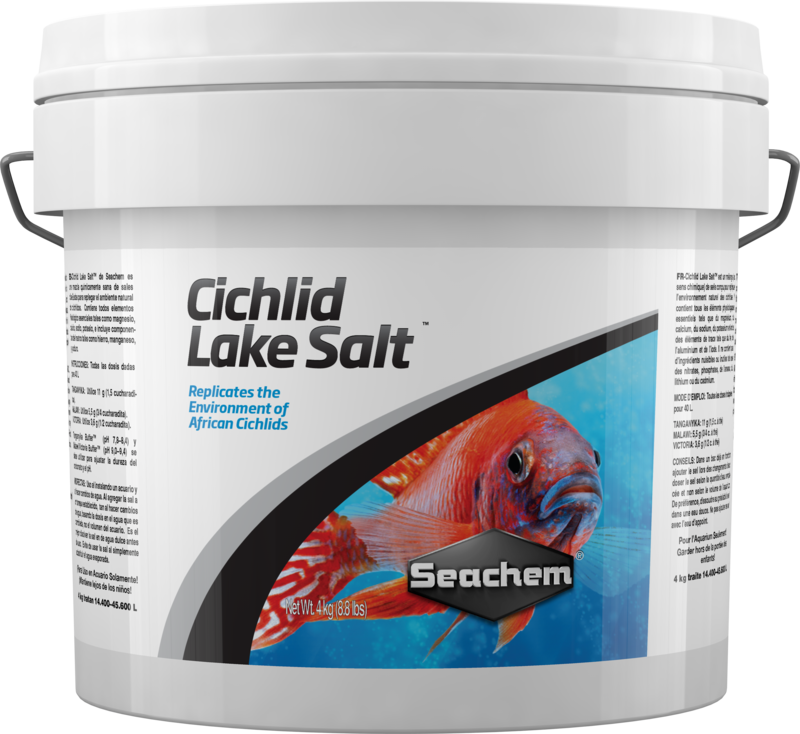 A: Cichlid Trace™ and Cichlid Lake Salt™will have the same type of minerals as these are the minerals known to be beneficial for Cichlids due to the fact that these are the exact minerals found in their natural environment, the African Rift lakes. That being said, the concentrations of these minerals are vastly different between the two products. Cichlid Lake Salt™has much higher volume of these minerals. Cichlid Trace™ has the same minerals, but in trace levels. You can use both, Cichlid Lake Salt™will be used to initially set mineral levels or it can be used when performing water changes to add minerals to the replacement water, and Cichlid Trace™ can be used a few times a week between water changes to provide a steady stream of nutrients that the fish will take in through their gills.